Who says your junk drawer has to be cluttered? This versatile 23 compartment drawer storage system features 2 bins. The lower bin has 14 sections perfectly sized for small household or craft items, such as tape, scissors, batteries and tools. The upper bin has 9 sections and fits perfectly on top of the lower bin, sliding easily so as to not block your view to the items below. 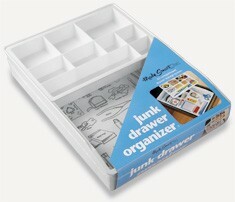 With this organizer, there is no reason to ever wonder what is in your “junk drawer”.